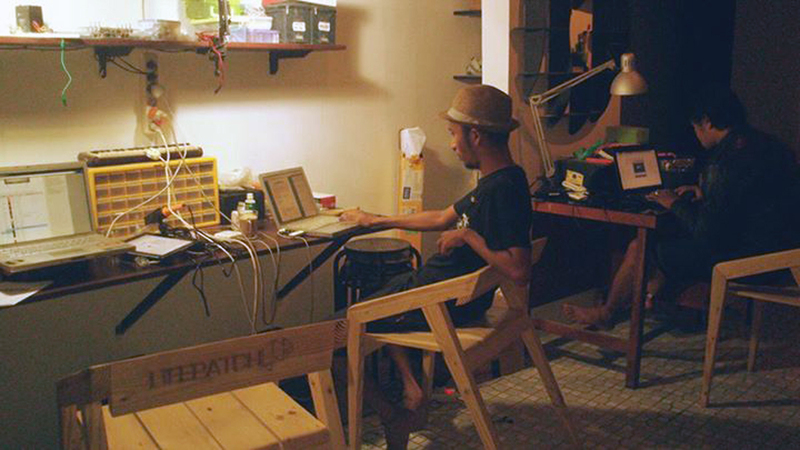 During 2013 in Yogyakarta, lifepatch members have been continuously working in building the bio-electronic lab at our home base. We managed to convinced our landlord to use the room just beside the house for our lab. Earlier before patching the lab, we were making future plans (pic above) on what to do with the house. At first, we were thinking to use the room as a community store as an income to support the financial of lifepatch. But then we thought the ideal plan is to convert it as a lab, to support our projects and activities in Bio-Design for The Real World. The room was used as a storage for anythings that we didn’t use. It was a mess. A big mess. It took so much time to arrange it and packed them all together. We moved all the stuff to a smaller room located on the backyard of our house. It was quite a huge work for us and took a lot of time. We finally clean the room in July. For me personally, the hardest part was to move the electronic lab that was located in the middle of the house. I worked there almost everyday. Even though it was a modest lab, I liked it a lot. I know exactly where’s the stuff is. But of course if you would like to work with other people in a lab, that means you need to make more space for people to work. This electronic lab was too small. It barely fits 3 people in the area. By the end of June, we finally clean the electronic lab and move it to another room. In reality, our plan wasn’t really smooth. The budget for Biodesign is a bit rough and not to detailed. We have a few budget allocated for Bio-lab and Electronic lab and we thought the most important thing to do in the beginning is the renovation of the room that we’re going to use. What’s the use if we bought equipments but didn’t have a place to store them? We know that we have a very limited budget to spend so we carefully planned how the budget can be efficiently distributed to the infrastructures of the labs and also the basic equipments for the research. We did make some desks by ordering a carpenter to do it for us. It was quite reasonable price. But we didn’t exactly impressed with the result. So we thought the best is to make it ourselves. We bought some woods and designs ourselves our own chairs and tables. Kim Sing, our friend was the main guy who helped us in building this furniture. We didn’t have any backgrounds or experiences in working with woods, so he was very helpful in the creation of the lab. Bellow is the final results of the lab. Thank you Kim Sing, for your spirits, energy and time to make this possible.